Five of the proposals received the approval of more than 60% of Americans and the sixth top ranked proposal (limiting the mortgage interest deduction) received an approval from nearly half (49%). I did some quick calculations on the 10 year impact on the deficit of just doing these six top-rated things. I get a 10 year savings of nearly $2 trillion (and I think I'm low balling it.) I know the Republicans are demanding $3 trillion over 10 years, so this falls a bit short. But, think about it. 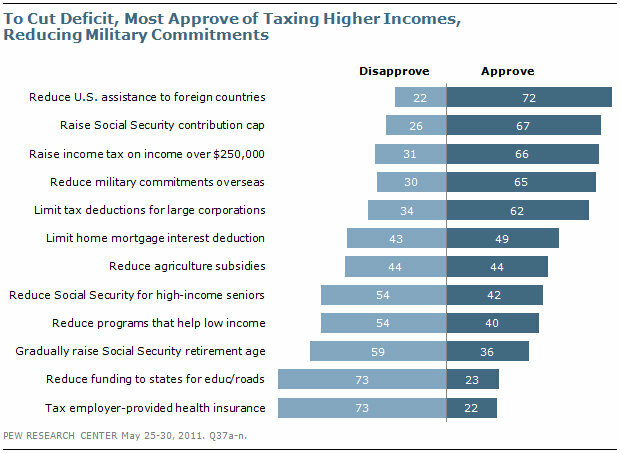 These are spending cuts and/or tax hikes that half or more of Americans think are okay. In fact, they are what the voters are recommending. All Congress has to do is listen and then act on these voter recommendations. Doesn't seem such a hard for politicians to do. After all, they would only be doing what the voters want them to do.